Sometimes there are weekends you just want to do over simply because they were so much fun. This past one is one of them. We went blueberry picking! It was insanely hot out there (even though we made sure to go at 6pm) but it was a lot of fun. 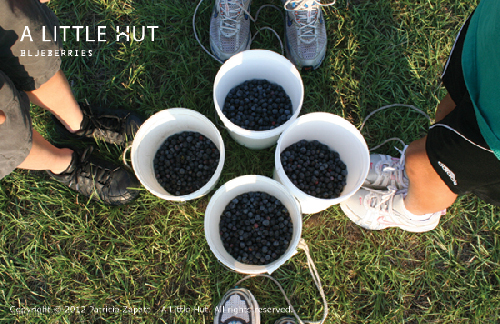 To top it off we now have berries to eat for days and days (they're organic and only $2lb—at Moorehead's Blueberry Farm). Random thing I'll remember: The kids would yell "Marco" and strangers among the trees would yell back "Polo". Everyone was laughing and we had no idea who was answering. Funny how sound travels in a field. I'm taking it slow this week and getting ready for our trip. I can't wait! I hope you all had some rest and fun too. Ta-ta!